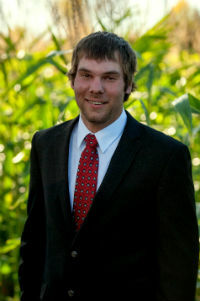 Jordan Zuehlsdorf joined Corn Capital Innovations in April of 2013 and is the Warehouse Technician. He is in charge of all the company’s shipping and receiving. Jordan does his job with great accuracy and takes pride in keeping the warehouse clean and organized. Jordan was raised on a farm near Belview, Minnesota and still resides there today. His family raises cattle, corn, soybeans, and alfalfa. Since 2004, Jordan has worked at their family owned business, A & J Processing, located outside of Belview, MN. A&J is a meat processing center where they slaughter, cut, and package products. Jordan has worked in all facets of the family operation. Working hard and maintaining a clean work area has followed him in all facets of his life and is now an essential element as the Warehouse Technician for CCI. Between 2010-2013, Jordan also worked for Straight Up Builders, which is a construction company that specializes in pole sheds, siding, windows, insulation and other miscellaneous projects. Jordan was an avid member of Future Farmers of America during his high school years. He enjoys hunting, fishing and pretty much anything outdoors!